TUCSON, Arizona, January 10, 2011 (ENS) – Arizona Congresswoman Gabrielle Giffords, who was critically wounded Saturday in an asassination attempt at a mall parking lot in Tucson, was a longtime ally of the environmental movement and recipient of the Sierra Club’s 2005 “Most Valuable Player” award from the Grand Canyon Chapter. The award was given “in recognition of her unwavering commitment to environmental protection,” the environmental group said Sunday. “Gabby is a strong environmental champion who cares deeply about Arizona,” said Sierra Club Grand Canyon Chapter Director Sandy Bahr. Six people were killed and 14 others wounded when a gunman opened fire in front of a Safeway supermarket in Tucson, authorities said. The congresswoman had been hosting a pre-announced event entitled “Congress on Your Corner,” at a Safeway store at 7170 N. Oracle Road on Saturday morning when the attack began. Among those killed were Chief Judge John Roll, a U.S. District Court Judge for the District of Arizona; and Giffords’ staff member Gabriel Zimmerman. The other fatalities were New Jersey grandmother Phyllis Schneck, Arizona retirees Dorothy Morris and Dorwan Stoddard, and Arizona resident nine-year-old Christina Taylor Green. Giffords’ staff members Pamela Simon and Ron Barber were seriously wounded in the shootings. Today Rep. Giffords remains in critical condition at University Medical Center in Tucson after brain surgery on Saturday. She has responded to commands and is continuing to recover; she is still on a ventilator. Jared Lee Loughner, 22, is charged with five federal crimes – one count of attempted assassination for shooting Giffords, and two counts of attempted murder and two counts of murder. He may face state charges as well. Loughner made his first appearance in court today in Phoenix. Judy Clarke, a federal public defender known for handling high-profile cases, has been appointed to represent him. He offered no plea and was not granted bail. On the House Science and Technology Committee, Congresswoman Giffords has promoted an agenda of energy independence and solar initiatives in an effort to make Southern Arizona the “Solar-con Valley” of the nation. She serves as vice chair of the House Sustainable Energy and Environment Coalition. In her district, Arizona’s 8th Congressional District, Giffords launched a Community Solar Energy Initiative to mobilize support and action for the increased use of solar energy. It includes an advisory council of university researchers, business leaders, elected officials and interested citizens to make recommendations on how solar energy could be advanced in Arizona. This effort led to the passage of legislation to encourage research and development and the training of a solar energy installation workforce. Giffords also fought for an eight-year extension of the Investment Tax Credit for commercial and residential solar projects. 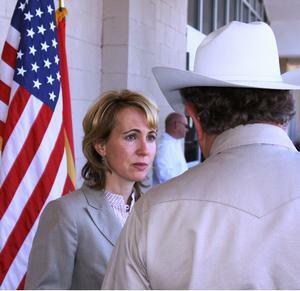 Giffords was rated 100 percent by the League of Conservation Voters for her 2009-2010 voting record in the 111th Congress. Her environmental votes were not limited to protecting Arizona’s lands and waters. She voted in favor of holding Big Oil responsible for disasters like the BP oil spill in the Gulf of Mexico and lifting the $75 million liability cap for oil and gas drilling operations, a bill that failed to pass the House. She voted to adopt national policies to prevent ocean acidification, improve research on the impacts of acidifying seas and address the impacts of ocean acidification on marine ecosystems and economies, another bill that failed to pass the House. She voted in favor of The Home Star Energy Retrofit Act of 2010 that would reduce pollution and create an estimated 168,000 clean energy jobs over the next two years, a bill that passed the House but did not become law. In 2010, Giffords also voted to increase funding for clean estuaries from $35 million to $50 million annually for fiscal years 2011 through 2016; to fund two NOAA environmental education programs on water systems, and to better manage of sediment and nutrient loss in the Upper Mississippi River Basin. 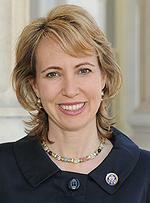 Giffords holds a Master’s Degree in Regional Planning from Cornell University. She is married to Captain Mark Kelly, a Navy Pilot and NASA astronaut, and is the only U.S. Representative with an active duty military spouse.